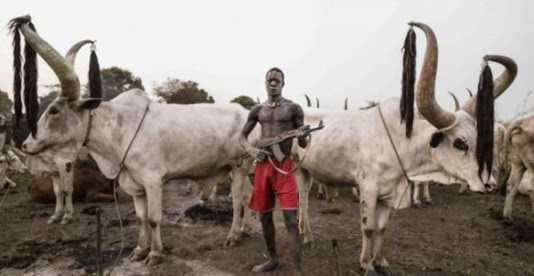 Fulani herdsmen, on Saturday, attacked the Okoklo community in Agatu LGA of Benue State, killing Mr. Andrew Ataboh and his son, Benjamin, while they were working on their farm at Inahem. It was further gathered that the father and son were abducted by the herdsmen in the farm on Friday while their bodies were found by some Agatu hunters on Saturday morning. A resident of the community, who is the Supervisory Councillor for Finance and Appropriation in the Agatu LGA, Mr. John lkulono, said the herdsmen, after hacking the father and son to death, removed their vital organs and dumped their bodies in the bush. According to Punch, Ikwulono alleged that about five officers of the Armed Forces deployed in the Okokolo area for protection were withdrawn to Makurdi without any reason, leaving the community prone to attacks. He said, “I had earlier alerted members of the public and the concerned authorities prior to these killings that herdsmen were planning to attack my community but I got no response from anyone, not even the security operatives. Efforts to get the reaction of the police authorities failed as the Command Public Relations Officer did not pick his calls. Meanwhile, the troops of the Nigerian Army have arrested a suspected Boko Haram terrorist, Saidu Jenga, who was caught discussing terrorists’ activities through the telephone. It learnt that the 33-year-old suspect was arrested by troops of 33 Artillery Brigade along Maiduguri Road in Bauchi State. This is just as troops of Operation Lafiya Dole killed five Boko Haram terrorists in the Barkin Dutse area of Adamawa State following a distress call from some hunters. It was learnt that the insurgents exchanged fire with the troops, which resulted in the killing of five of them, while one hunter was reportedly shot dead. According to the army, items recovered from Jenga, included one Tecno phone, with two sim cards as well as N6,870 cash.